Sitting in the boardroom can sometimes feel like being in the path of an asteroid on the way to Earth. A huge crash seems inevitable, and you can’t really get out of the way. As a COO, I have had a front row seat to the transformation of marketing into a digital function, and how that has affected the relationship between the Chief Marketing Officer and the Chief Information (or Technology) Officer — sometimes the view has been a little scary! The merging of these two worlds has created a new paradigm in the relationship between the Marketing and Technology C-Suites, driving the need for a unified and collaborative relationship between them. In fact, neither the CMO or CIO can succeed today without support from one another. In the past, the marketing and technical budgets existed in their own separate realms, presided over by their own sovereigns. Marketing’s budget rarely included technology; if it did, it was about using a common system that was already around (like a CRM). With the mainstreaming of digital marketing, though, the marketing folks can’t do their jobs without a wide array of technologies. Today, CMO technology spending is one of the largest components of enterprise information technology budgets. Additionally, both groups must now look at a third group as their common customer: Sales. So now we’re invading the CIO’s traditional orbit, forcing issues of budget accountability, control, and planning. And that’s not all. Marketing and technology strategies have become so intertwined that these two executives — who rarely had to collaborate on anything, let alone sit in the same room — now have got to become best friends overnight! Two very different minds need to meet, in order to deliver a successful digital marketing strategy that will push company growth. Moreover, if Sales doesn’t see alignment between the CMO and CIO, they won’t see value in that strategy and won’t support it. The evolution of the CMO/CIO realms are following much the same path as other technologies that were adopted in one area and became broadly used across the enterprise. Consider an innovation like the cloud, which initially was a way to reduce costs and improve performance in the IT department, before it burst forth as the new structure of digital business. And just like any technology evolution, this one has both low points and high points. The low points usually occur when the CIO and technology team cling to outdated boundaries: those walls around their castle that protect their realm and keep technology decisions within their control. At low points, marketing strategies get stalled, as the IT folks try to dictate best practice in marketing areas (“We’ll tell you what we can do for you”). Often some technology is in place that doesn’t fit marketing’s strategy, so marketing goes and gets what they need for their plans, many times without the understanding of how this impacts IT. . .somebody needs to make it work! This leaves IT to fit it into the ecosystem after the fact. Lots of time and money and frustration ensues. The high points occur when both parties realize that the dividing walls have already crumbled, and that the old “lord of the castle” way can’t work anymore. Complexity has ratcheted up, so it’s no longer a matter of marketing saying to the technology team, “Get me this one piece of technology.” The marketing automation system is core, but a host of other technologies — data, measurement, predictive platforms — need to come into play. (I see most mid-size to large enterprises having anywhere from 12-20 technologies in their marketing stack.) At the high points, the CMO and CIO have a really tight linkage, and are proactively crafting their strategies together. 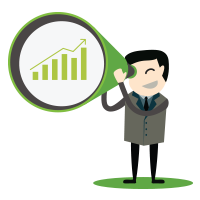 The revenue of the company is dependent on these systems in real-time. The technology group needs marketing’s knowledge about these technologies and how they will be used, but marketing needs help from the technology group to get the budget and help manage these systems. Enter the odd couple: new best friends the CIO and the CMO. Sometimes it just works, and other times, it’s hard to watch! This interesting shift is almost blending the two positions together; the strategies and the technologies are such that neither one can really call the shots alone. And the pace of this change is not slowing down, but accelerating. We need much tighter relationships, interdependent budget planning, day to day collaboration at a whole new level to make it work. The best marketers have incredible relationships with their technical folks, the CIO or CTO office. Those struggling usually don’t. 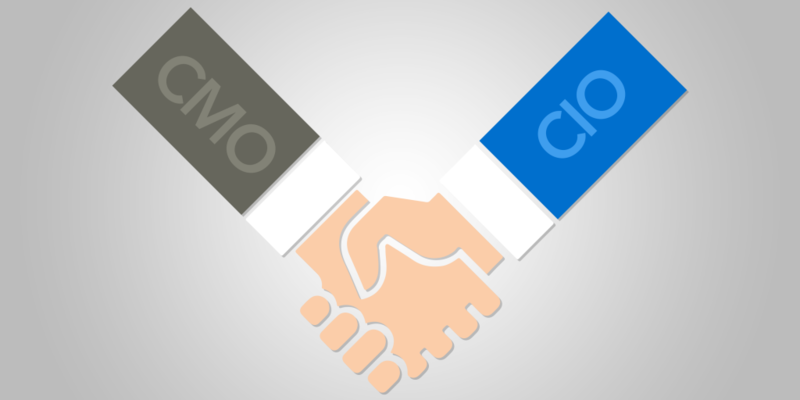 We have talked a great deal about the alignment between sales and marketing, but really, the alignment between the CIO and CMO is just as important. The CMO takes a proactive approach to planning the marketing strategy and digital systems impact prior to executing, or reaches out to the CIO before all the building blocks get put in place and they start to collaborate on the budget and the systems and the software to map it out. And Sales must trust that marketing and technology are working together to give them what they need, or that critical buy-in of the Sales team starts to erode. Assessing the marketing stack with technical needs, and tying them all back to the strategy. So many clients find this very difficult because the technical and marketing groups speak different languages, and sometimes are in violent agreement without realizing they are talking about the same thing in different terms! You need someone to translate, as well as to help you recognize common ground. Mapping out that ecosystem that they need to build and maintain based on their goals. 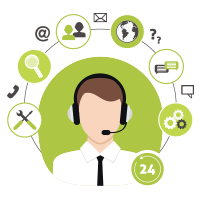 Building on the assessment and the growing understanding between the two groups, a third party such as DemandGen can bring best practice knowledge and a great deal of experience to bear on your system development and integrations. Forging a close relationship between marketing and technology. Working up front to build a close relationship can save you a lot of pain and effort, moving you from a reactive state to a proactive one. Proactively understanding the co-dependencies between technology and marketing strategies is our sweet spot. The amount of progress and value you can provide is directly impacted by how well you understand both sides of the creative versus technical dynamic. Articulating value clearly. When you start talking about ROI, you bring a new level of transparency to understanding marketing value, and that can make all the difference to non-marketers. For example, you can have a goal for generating X number of leads in X amount of time, or raising lead value, or going deeper into accounts, and you must demonstrate clearly how technology will help you do that. Hey, it’s confusing out there. The complexity of the new Digital Marketing landscape is what gets guys like me out of bed in the morning. I am lucky enough to be surrounded by some of the best technologists and marketers I’ve ever worked with. Making sense out of this rapidly evolving landscape is what we do every day. Understanding our customers’ pain points and gluing all of the pieces of this strategic and technical puzzle together is why we are here. Don’t forget how important the CMO/CIO alignment is, and you will be way ahead of the game as you build your Demand Factory™ of the future. As DemandGen’s Chief Operating Officer, Greg Carver brings nearly thirty years of operations experience in the high-tech and enterprise software industry. As a strategic operator, Greg has consistently proven success as a turn-around executive, change agent and catalyst in taking technology companies to the next level. He is a hands-on customer champion with a passion to build a culture of exceptional client relationships and experiences. As an innovative mentor and determined leader, Greg’s devotion to hard work and team building translates to company success.